Assay used to assess food for gluten. Study authors state that 20/169 products tested contained detectable but unquantifiable gluten below 1 ppm and 4/169 contained quantifiable gluten at or above 1 ppm. However, they also state that the ESGLISS-48 ELISA from ELISA Systems was used to assess products for gluten. According to the manufacturer this assay measures low levels of gliadin in the range of 2 to 20 ppm gliadin. This corresponds to 4 to 40 ppm gluten. It is therefore curious why the study authors are reporting 1 ppm gluten as the limit of quantification. In addition, according to the manufacturer the ESGLISS-48 ELISA is based on the antibody to the omega-gliadin fraction of wheat protein. Assays based on this antibody have a very low cross-reactivity to barley. This means that any barley contamination in gluten-free foods will be greatly underestimated. Assay used by Gluten Free Watchdog, LLC. 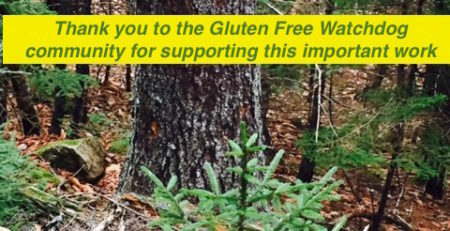 Products tested through Gluten Free Watchdog are tested using the R5 ELISA Mendez method. This is the Codex Type 1 method for measuring gluten contamination in food. 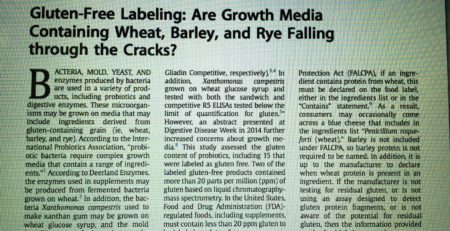 It is also one of two assays the FDA has stated it will use when necessary to assess compliance with the gluten-free labeling rule. This assay has been fully validated in a multi-laboratory ring trial by the Prolamin Working Group. 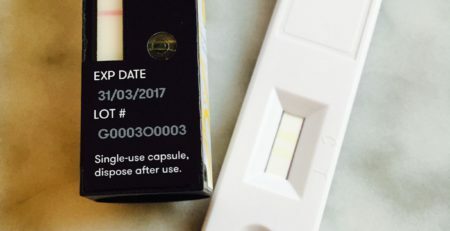 It has a limit of detection of 1 ppm gluten (depending upon the makeup of the food being tested) and a limit of quantification of 5 ppm gluten. 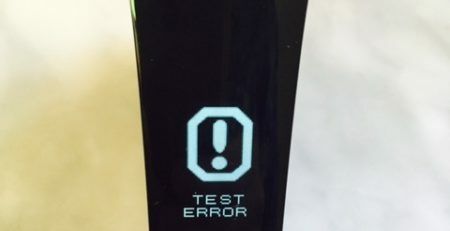 Most labs report test results down to the lower limit of quantification. Results below this level cannot be quantified. In addition the limit of detection will vary depending upon the product being tested. That said, the standard in Australia and New Zealand currently is no detectable gluten. 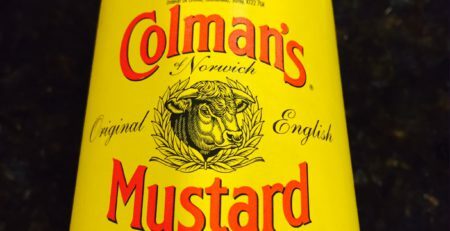 What would be helpful in the future: It would be interesting for the researchers to assess imported and domestically produced foods sold in Australia using the R5 ELISA. 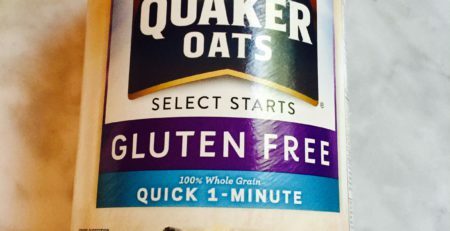 One popular Australian brand sold in the US and tested by Gluten Free Watchdog had gluten levels above the lower limit of quantification of 5 ppm (but below the 20 ppm standard required food foods labeled gluten-free in the US). Very interesting and thank you for the clarification Tricia! I knew you could tell us what is really going on. It’s very telling that Coeliac New Zealand does not support that research. I should have been more clear when I reached out to you. I was not questioning why GFW does not/can not test below 5ppm quantification, but why we, in this country, can not test below 5ppm quantification because as I understood it, that is the lowest any test can test at this time. So do I understand correctly that since the standard in Australia and New Zealand currently is no detectable gluten; that would mean that foods tested by GFW which tested below 5ppm limit of quantification would be acceptable by their standards since no lower limit of quantification testing of gluten is possible at this time? Hi Ann, Your questions are great but not easy to answer. One of the reasons FDA adopted the 20 ppm standard is because the agency believes this is the lowest level that has been scientifically validated to reliably detect gluten. This despite the fact that the FDA uses the R5 ELISA Mendez method for testing and this assay has a lower level of quantification of 5 ppm. Believe it or not I had a “back and forth” with Dr. Mendez and the FDA about this very issue. But the FDA continues to believe what they believe. I hesitate to comment on the standard in Australia and New Zealand because from what I understand it is in flux and under debate. Currently the standard is no detectable gluten. The limit of detection for the R5 ELISA historically has been listed as 3 ppm gluten but recently was changed to 1 ppm gluten depending on the food matrix. There are many reasons why it is difficult to use a limit of detection as a standard. It varies by food matrix; it is hard to know whether what you are seeing is “noise” or gluten; as values fall closer to the LOD or LOQ they may become more inaccurate; and there is no way to assign a gluten value to amounts below 5 ppm. Hopefully this helps some! Thanks for this excellent description/explanation. Glad to hear the explanation makes sense! You are most welcome, Al. Thank you for pointing me to the statement from Coeliac New Zealand. It helped reinforce and confirm my feelings about this study.